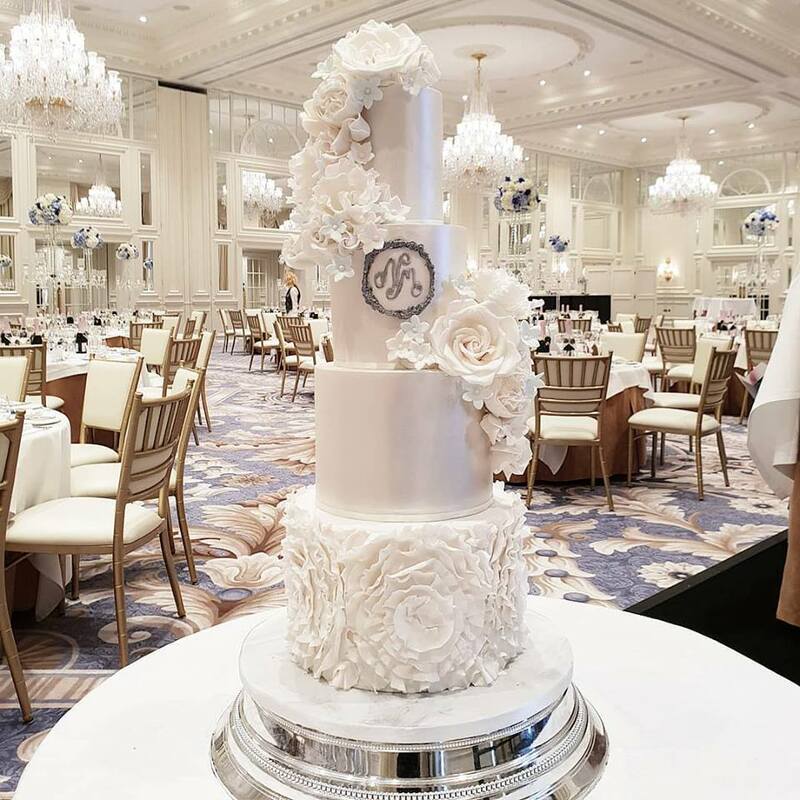 Award winning luxury wedding cake designers Rosewood Cakes create unique and artistic wedding cakes to wow your guests. 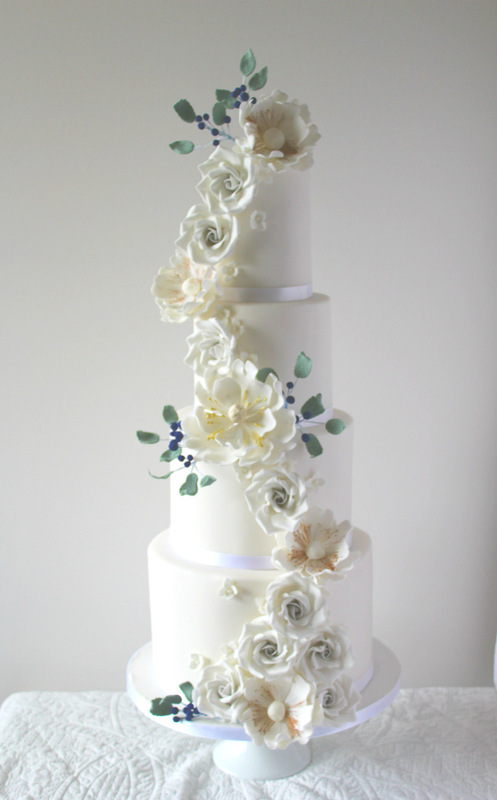 Based in Glasgow west end and specialising in designing beautiful, bespoke wedding cakes, husband and wife team Edwina and Chris have quickly developed a reputation for being one of Scotland's best wedding cake designers. Rosewood Cakes are recommended wedding suppliers to some of Scotland's most stylish and exclusive wedding venues such as Skibo Castle, Mar Hall and House for an Art Lover, and their artistic wedding cakes have featured in renowned publications. Even the flavours are bespoke to the client’s personal tastes, and all flowers and detail work are meticulously hand-crafted from sugar. Passionate about food, only fresh, natural ingredients of the highest quality are used in their recipes, so that each wedding cake is beautiful on the inside too. Their recipes have regularly featured in the Sunday Herald, you can read an example here. 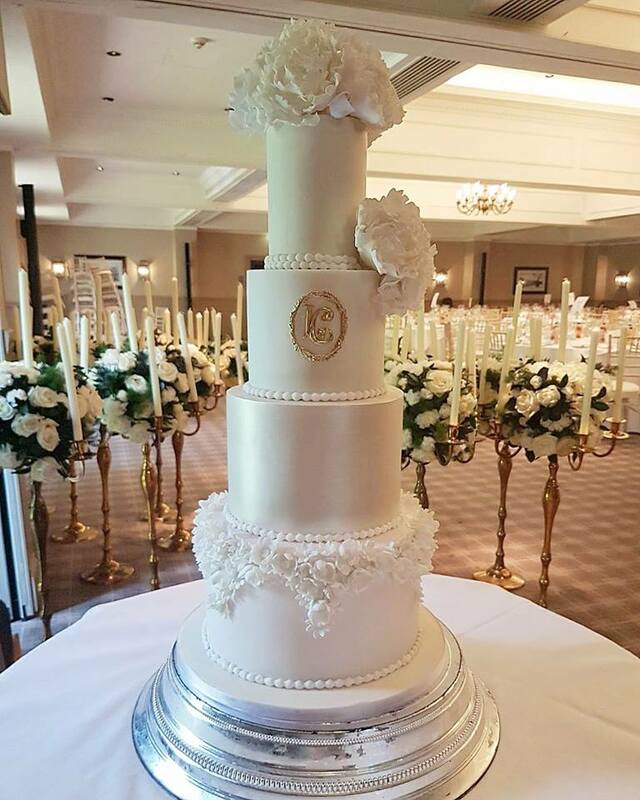 Rosewood Cakes are based from a home studio in Glasgow West End and provide elegant, high-end wedding cakes throughout Scotland, particularly within Ayrshire, Perthshire, Fife and Loch Lomond. We're Edwina & Chris McNulty, the husband and wife team behind Rosewood Cakes. Five years ago, we never would have dreamed that we would be running our own business, and this year we were delighted to win 2018 Regional Wedding Cake Designer of the Year at the Scottish Wedding Awards! A love of food and baking led Edwina to start making cakes after the birth of their second child. The orders came in thick and fast, and she left the corporate world of HR consultancy to launch Rosewood Cakes full time in 2014. In 2017 Chris gave up work to join the business and become chief baker and ganacher, while Edwina does the decorating and design. Our little cupcakes Holly & Charlie have their own cake boxes and are shaping up to be little bakers! Don't worry, we don't actually let them near customers cakes, much as they'd love to.... We love our job, it's such a happy and positive environment to be in, and a real joy to be involved in our clients' weddings. The success of Rosewood Cakes is attributable to our ethos of quality customer service, attention to detail and ensuring everything produced tastes as good as it looks. We want your guests to be wowed when they see our creations, and we put our heart and soul into your cake, spending hours on the details. We were featured in the Guardian, and you can read our story here. Why order your cake with Rosewood Cakes? At Rosewood Cakes we go the extra mile to create your perfect cake. Our tiers are extra tall, coming in around 6" high each. A four tier cake with flower topper will come in around 10" higher than most other wedding cakes, so it will really stand out. We spend time and care to get the 'sharp edges' that are part of what defines a designer cake, rather than the rounded edge to the tiers which comes from a quick application of icing. All our decorations are skillfully hand-made which takes considerable time to achieve. We use only the best ingredients, and are committed to ensuring your cake tastes as good as it looks! Can I sample the cakes before going ahead with an order? Absolutely! We encourage you to try new options alongside the classic sponges, we love to create bespoke cakes with your favourite flavours. 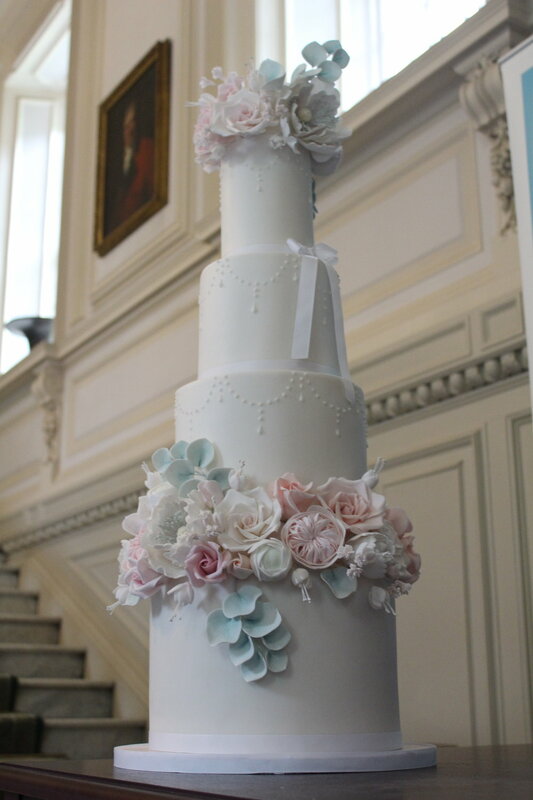 Our wedding cake consultation enables us to capture the individuality of your big day and create your dream wedding cake. During our consultation we take the time to get to know you and understand your wedding, and we encourage clients to bring along anything that might help us guide them towards the perfect choice, such as a sample invitation or a swatch of detail from the wedding dress. Mood boards and pinterest boards are always welcome! 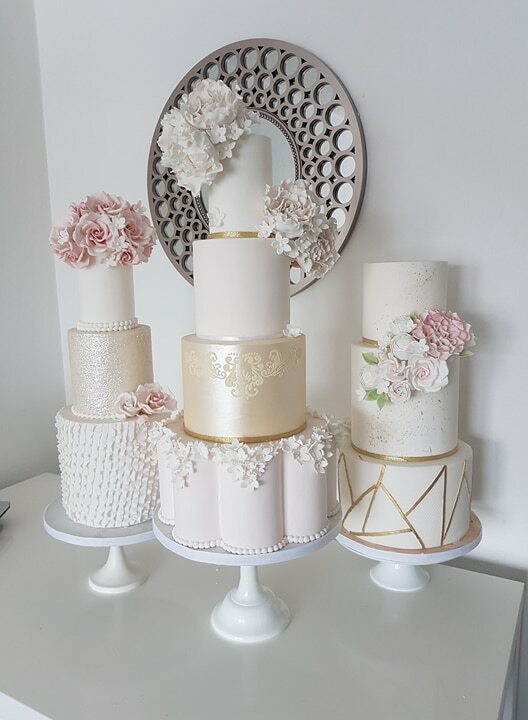 However if you are unsure on what style of wedding cake you are looking for, or haven’t yet confirmed other wedding details then that’s absolutely fine. We’re here to help. Do you deliver the cakes to the venue? Yes, the stacked cakes can be very fragile and we recommend that we transport the cake to the venue. Delivery is free within Glasgow city, A delivery charge of 0.50p per mile for the return journey applies for wedding cakes to venues outside Glasgow. A £50 non-refundable deposit is required to secure your order, with the full balance payable four weeks before the cake is due. Due to high volume of requests we cannot secure a date without a deposit. The cost of the finished cake will vary depending on the design and the portion size. If you have a budget in mind please let us know! We are happy to accommodate dietary requirements, and create cakes which are gluten-free, vegan, dairy-free, egg-free, vegetarian and alcohol free. None of the free-from recipes we use compromise on flavour. Please be aware that the cakes are made in a kitchen which contains gluten, dairy, wheat and there may be nut traces. Please note on your order form if you have any food allergies or intolerances we should be aware of. We're not just about appearances or style over substance! We're serious foodies and we will ensure your wedding cake tastes as good as it looks. We have two seasonal cake menus, with an emphasis on light, fresh and fruity flavours in spring/summer, whereas autumn/winter has more pudding flavours. You can have different flavours in each tier of your wedding cake, and we encourage you to challenge us to create something new! Our cakes are made from scratch using the highest quality ingredients - real unsalted butter, free range eggs, vanilla bean extract and chocolate with a minimum 50% cocoa content. We use artisan icing and the best quality, professional grade flour. You will never find a synthetic ingredient in our cupboards! We bake light, moist sponges that will keep several days if stored correctly. Our cakes are covered in a layer of white chocolate ganache between the sponge and the icing. The ganache coating helps give the cake a stronger structure, and enables cleaner straighter lines, rather than a rounded edge. It also tastes lovely and creamy. We cater for dietary requirements and allergies - whether it be gluten-free, egg-free, nut-free, dairy-free, vegan or anything else. A lot of time was invested in testing our free-from recipes to ensure that they still taste as delicious as our standard sponges, and we are often told that it's the best our clients have ever tasted! Thank you for taking the time to look at our website and finding out more about our work. You can click on the link below to open the contact form and tell us all about you and your wedding, we love to know the details! We aim to reply to all emails within 24 hours, please check your junk folder as sometimes our responses find their way in there.